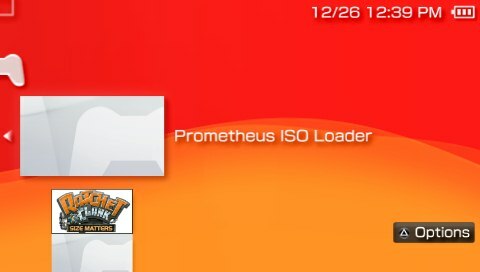 This guide will help you install the Prometheus ISO loader on your PSP. Once you’ve run the loader you will get the screen you see below in which you can run ISO games off your PSP’s memory. Enjoy your Free PSP Games . Be sure to check out the Prometheus ISO loader compatibility guide. the file is corrupted what will i do? What is your current firmware version? Check the system information your PSP’s menu. 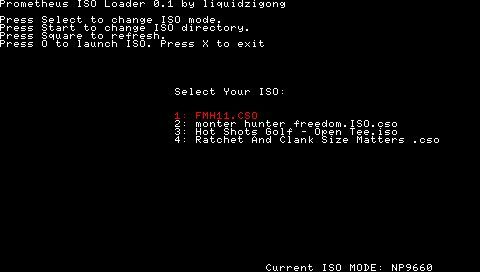 how do i get the iso/cso on my psp? Hiya major problem, when booting into game redirects me to XMB, any solution ? Which game are you having problem with? when i enter into the prometheus iso loader menu the screen freezes and i am unable to do anything from there. I have to restart my device. Can you please help me with this problem? What is your PSP’s current firmware? When I enter prometheus iso loader, it’s as if my psp has just started. The logo Playstation appears, freezes the screen, and then shut down. What is your current firmware? 6.20 or 6.20 TN? Well, my psp says: System Software Version 6.20. Is that why it’s not working? my psp is psp 3004 with version 6.31 and the iso loader dont run, says file is corrupted.. why? You need a Hen or LCFW running before you can use the Prometheus ISO loader. Please check the requirements at the start of the post. Can you clear that up again? You downgraded to 5.00? What is the current firmware that your PSP is giving you? I currently have cfw 6.20 TN-A installed onto my PSP GO PSPN1001. I also have Prometheus ISO Loader installed and it boots fine, but I cannot figure out the file directory for my ISO’s to go into. All I really want is monster hunter portable 3rd to run. Is firmware 6.35 possible to remove? or am i stuck with it now? if its possible to revert to normal updates how do i go about this? If you install an LCFW for 6.35 OFW then you can easily revert to OFW by uninstalling it. If you need more information, please checkout the dummy’s guide. Can you post a screenshot of the files in your ISO folder?